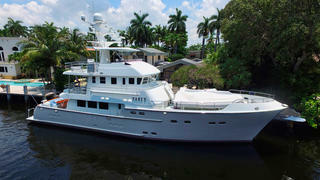 The 23.24 metre motor yacht Take 5 has been listed for sale by Michael Selter and Neal Esterly at Fraser Yachts. Built in GRP by Nordhavn to a design by Jeff Leishman, she was delivered in 2009 as a long range explorer yacht. Featuring teak panelling and joinery throughout, she accommodates six guests in three cabins consisting of a main deck master suite with two doubles below, all with flat screen television sets and en suite bathroom facilities. The main saloon belies the robust exterior of this yacht for sale, with Berber carpeting, an L-shaped settee and coffee table to starboard and a custom dining table and six chairs to port while forward is an entertainment centre including a 55 inch Samsung television screen and a Bose stereo surround sound system. Unusually, the galley has an open configuration to the saloon in order to facilitate entertaining. Up on the bridge deck is a pilothouse helm position, the captain’s cabin and a dinette for casual snacks aft of the helm. The aft deck is large with seating and a table for al fresco dining and is protected by a sun shade. The engine room has had extensive noise controls and insulation installed to ensure quiet for guests while undetaking long passages. In 2014 a refit saw her receive a fresh hull paint job, upgraded electronis and audio/visual systems and five new television screens. Twin Cummins 355hp diesel engines give her a range of 3,850 nautical miles and she is fitted with Trac zero speed stabilisers. Lying in Fort Lauderdale, Florida, Take 5 is asking $3,495,000.